This should be a terrific show. 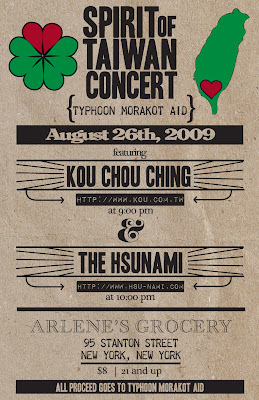 The Hsu-nami will double-bill with Taiwanese indie hip hop group 拷秋勤 Kou Chou Ching on August 26th in New York. All proceeds will go toward Typhoon Morakot Aid. This performance date falls on the first week of the fall semester and between the two days that I teach. I will be there nevertheless! ALL PROCEEDS OF THE SHOW (from The Hsu-nami) GOES TO TYPHOON MORAKOT AID. best Artist Awards in Taiwan Golden Awards. unique sound. Through our music, you can hear the voices of Taiwan." the group has recently been nominated at "Just Plan Folk Music Award"
classical music and folk ensembles to take the place of lead vocals. Hsu-nami’s music is featured in the 2008 Summer Olympic in Beijing. Chinese Basketball team entrance theme.